The Brotherhood Of Man first became known internationally in the early seventies with hits like United We Stand and Where Are You Going To My Love. 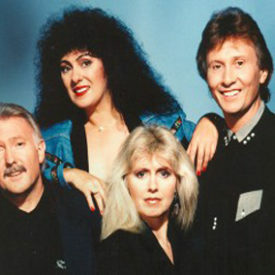 The line up of Nicky Stevens, Sandra Stevens, Martin Lee and Lee Sheriden followed on with the continental success of Lady and the million seller Kiss Me, Kiss Your Baby in BeNeLux. 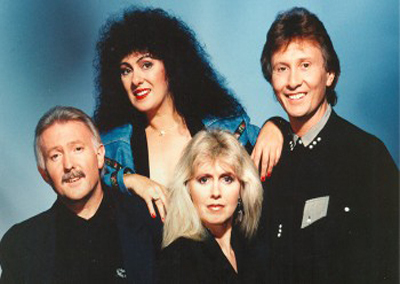 In 1976 they won the Eurovision Song Contest with the much loved song Save Your Kisses For Me. The song proved to be one of the biggest selling records of all time, selling in excess of 5 million copies. It was number one in 33 different countries including the UK, where it held the top for six weeks. The group followed on with two more British number one’s in the shape of Angelo and Figaro. They also had a string of other hits including My Sweet Rosalie, Oh Boy, Middle Of The Night and Beautiful Lover. Altogether, there were 5 hit albums, earning each member of the group a total of 26 platinum, gold and silver discs. The three number 1 hits, as well as most of the other hits, were co-written by group members Lee Sheriden and Martin Lee along with Tony Hiller. As writers they have each one three Ivor Novello awards. The group were honoured to appear at the Royal Command Performance 1977 for the Queen’s Silver Jubilee and have also topped the bill in almost every Theatre/Concert Hall in the UK, including The London Palladium and The Royal Albert Hall. Their phenomenal international success, together with their own very special brand of entertainment, has taken them literally, all around the world performing on television, in concerts and in cabaret. They are proud to boast today the exact same line-up of four faces known to millions of TV viewers and pop fans all over the world.